Sold together with Two Worlds II. The GOG.com version is the only DRM-free version but does not have an OS X version. The latest retail patch is Update 2.0. 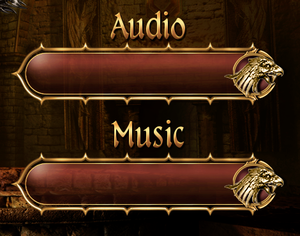 Digital distribution versions are already fully patched. 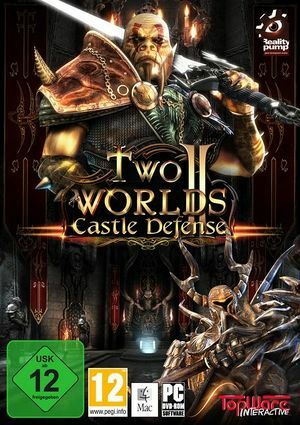 Apply the Two Worlds II Castle Defense intro skip. Unplayable (output rapidly flickers between alternating camera views). FOV is determined by aspect ratio. 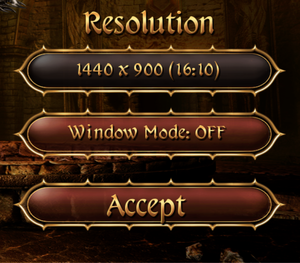 Set resolution in-game, restart game, then use Borderless Gaming. The game will now start normally. ↑ 1.0 1.1 File/folder structure within this directory reflects the path(s) listed for Windows and/or Steam game data (use Wine regedit to access Windows registry paths). Games with Steam Cloud support may store data in ~/.steam/steam/userdata/<user-id>/7530/ in addition to or instead of this directory. The app ID (7530) may differ in some cases. Treat backslashes as forward slashes. See the glossary page for details.